Replaced by the NanoKey 2. A USB-connected MIDI controller, Korg’s nanoKEY looks much like a mutated computer keyboard. It weighs less than a pound and takes up less room in one’s bag than a paperback book. At first blush, it seems impossibly thin and a bit cheaply made, but after a few minutes, I found it to be playable just like any other keyboard. It has a trio of buttons that approximate a full-sized keyboard’s pitch and modulation wheels (albeit in a binary fashion, no nuance available). There are also buttons that shift the keyboard’s range up or down several octaves, and a special CC mode that makes each key output a MIDI continuous controller value when struck (instead of a MIDI note) which is handy when trying to get a hold of the dozens of little buttons that festoon modern music software. There are several behavioral options under the hood, too, and the included editor makes tweaking things simple. So far, I’ve taken the keyboard with me on several trips and countless public transit rides. It has allowed me to take down ideas — direct to my laptop — that I never would have chronicled otherwise. It’s also just plain fun. I’ve been making music on computers since the early 90s, and the march of miniaturization and affordability in computer music gear has never ceased to astound me. The equivalent of a setup that once cost thousands of dollars to assemble and occupied an entire second bedroom now runs on a laptop which comes with me everywhere. 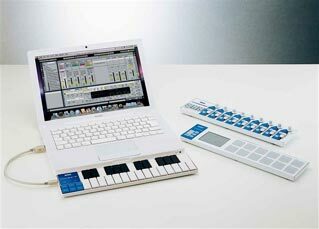 But one of the main things that remained a challenge to small-ify was the MIDI keyboard. M-Audio’s Oxygen 8 led the charge, being small enough to throw into a large backpack with one’s laptop, but it was still rather heavy and chunky. In time, various other keyboards were created that slimmed things down even further, but the form factor remained that of something you needed to create space for in one’s bag, and lugging one around all day was not a fun prospect.